After writing about the Premier League's best goal scoring partnerships a while back, I was inundated (one comment) with requests for something similar for other leagues. So, instead of signing up to do some accountancy exams that I've been putting off for 13 years, I decided the best way to spend some spare time would be to put together another list for absolutely no reward. I hope somebody somewhere enjoys reads this. With the return to favour of partnerships such as Suarez and Sturridge, (#dare to) Zlatan and Cavani, and Negredo and Aguero, what better time to have a look back at some of the best partnerships before them. Having searched a whole two pages of Google without finding something exactly the same as this, I thought it was time to put together a combined list. I've decided to go back 25 years to cover the 1988-89 to the 2012-13 seasons. Why 25 years? Well that just about covers my football watching memory and it's a nice round number. I've decided to include just the Top four Leagues in Europe - the top divisions in England, Germany, Italy and Spain (based on European Trophies won). A partnership is only considered so if both players (regardless of position)have scored at least 10 goals each. 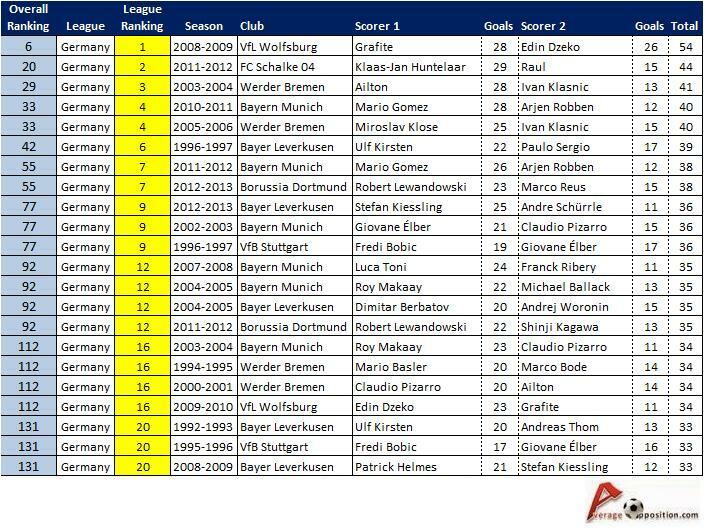 For this list, I've only combined those pairs with 30 goals or more, so sadly that would exclude van Wolfswinkel and Elmander's herculean haul of 2 goals from this season. Tough break fellas. A further blow to the Norwich duo's chances are that this season's partnerships are not included as they'll instantly make this post out of date. Expect to see Suarez and Sturridge included in the next update in space year 2038. Joking aside, as I type, Suarez and Sturridge have just hit their combined 44th, 45th, 46th and 47th goals of the season against Cardiff, so they definitely make it into the Top Partnerships list, but as the season hasn't ended yet, their number is likely to change. It's worth noting that the German League has fewer games, and the other leagues have varied in number of teams. And lastly, it's league goals only. In all, there's a whopping 221 instances of 30 goal partnerships in the Top Four European leagues over the last 25 completed seasons - actually a lot higher than I'd expected. Spain lead the way with 70, followed by England (61), Italy (49) and Germany (41). No real shock there as Germany has fewer games, as did Italy for a good chunk of the 25 seasons in question. In terms of clubs represented, there are a decent 61 (Spain 17, England 16, Italy 15 and Germany 13). 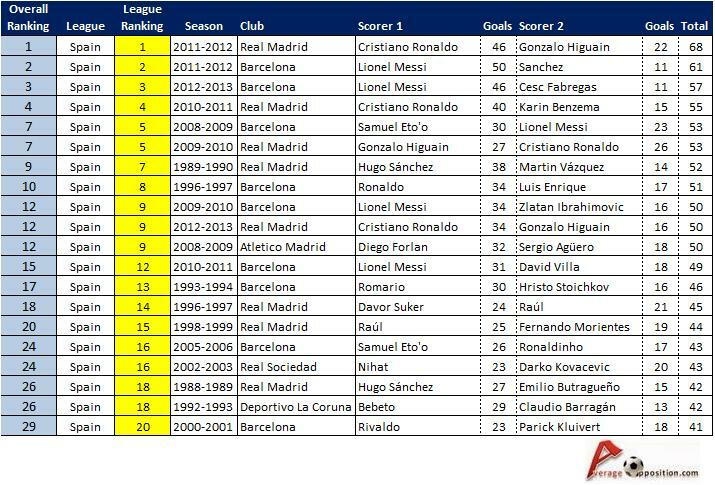 At the top end of the food chain are the mighty Real Madrid with a 30 goal partnership in 19 of the 25 seasons recorded. No wonder they win quite a lot. As you'd expect, anything they can do, Barcelona can almost do (that would make a catchy song), and the Catalans are second on the list with a healthy 17 partnerships represented. Aside from Spain, England have Man Utd and Liverpool in double figures (13 + 10), whilst somewhat surprisingly, it's Bayer Leverkusen who lead the way in Germany with 10 partnerships making the 30 goal mark. For Italy, AC Milan are the team with the most deadly duos, featuring 8 times. At the bottom end, there are 25 clubs with just one 30 goal partnership, sadly, my team don't even have that. The likes of Coventry's Dublin and Huckerby, are joined for their day in the sun by Villarreal's Forlan and Riquelme (2004-05). And who could forget Bochum's world famous Thomas Christiansen and Vahid Hashemian with their 31 goal haul in 2002-03. I know I certainly won't. As mentioned above, there's a great deal of 30 goal partnerships, so many in fact, that I wonder why I used that number. So to get things going, here's a list of those partnerships that scored at least 50 league goals in a season. Just to manage expectations - it's a bit heavy with Cristiano Ronaldo and Lionel Messi. In fact it's basically La Liga's greatest partnerships plus three others. As its illegal not to mention both Ronaldo and Messi when speaking about the Spanish league, it's worth having a quick look at their record in this list. Interestingly, both players have been part of a successful partnership as the second scorer - which is really what you'd have expected a few years back, with both players featuring out wide early on. Ronaldo's first season in Madrid saw him form one of the most balanced partnerships on this list, with Gonzalo Higuain. The Argentine banging in a decent 27 goals to the shy Portuguese's 26. A pretty good debut season before the championship manager stats started kicking in. Messi's season as the second scorer was in the 2008-09 season that saw Samuel Eto'o hitting 30 to Messi's 23. Man City fans may be surprised to see Edin Dzeko in 6th place with the wall decorating Brazilian Grafite (I'm sorry) making up the pair - the highest Bundeliga entry with 54 goals. Didier Drogba and Frank Lampard have combined for 30+ goals on two occasions, with the 2009-10 season seeing a combined 51 league goals for the Chelsea legends - albeit not a typical strike partnership. 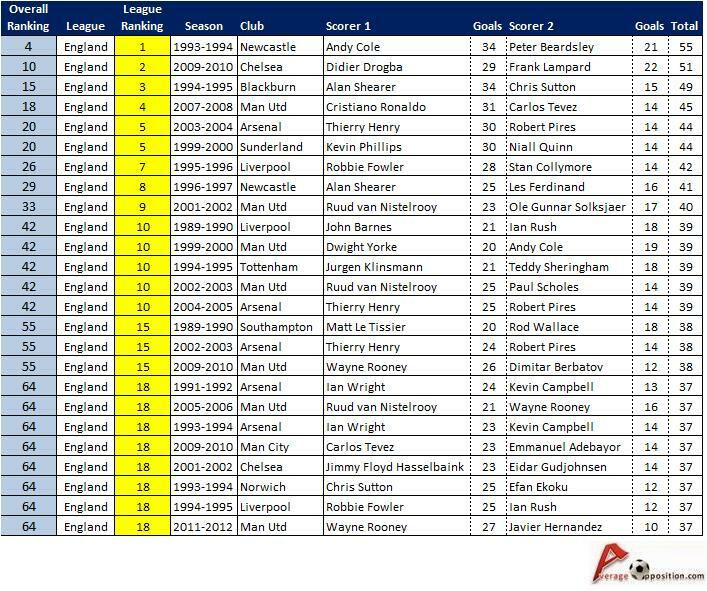 However, in first place for England are Andy Cole and Peter Beardsley with a whopping 55 - all for a promoted club too. Impressive stuff. Must have been before Cole needed five chances to score (Glenn Hoddle's words, not mine). Fans of 90s football will be disappointed not to see any Italian partnerships breaking the 50 goal mark but heartened to see the Original Ronaldo and (possibly the original) Luis Enrique with 51 goals in the 1996-97 season. Ronaldo who started the season aged just 19 would score 47 goals (all tournaments) in his only season with the Catalan giants. Damn you Gods of injury. What is also interesting (depending on your definition), is that 11 of the 50 goal partnerships have been in the last five years - at a time when 4-5-1's have become the norm. Although a lot of them are rather dependent on Messi or Cristiano Ronaldo being involved. The number one partnership sees Ronaldo paired up with Higuain for the 3rd time to make a 50 goal mark. The winning season being 2011-12 when Mourinho's men managed to break Barca's dominance of La Liga. A phenomenal 68 league goals from just two players is quite frankly bonkers. Both Ronaldo and Messi feature in four 50 goal partnerships - Messi with 4 different partners, the big flirt. I know what you're thinking - where's Vialli and Mancini? They were undoubtedly a great strike partnership, but they were also playing in the most defensive era of a league known for being defensive. They're best season together came in 1990-91 when they combined to score 31 league goals (ranked 35th in the Serie A charts). It also turns out there was top flight football in England before the Premier League, I'm just as surprised as you. There's three entries from the old Division One, with Barnes and Rush scoring a decent 39 combined goals in the triumphant 1989-90 season for Liverpool, followed by Le Tissier and Wallace (Rod) for Southampton and Wright and Campbell for Arsenal. Spain's list sees the crowd pleasing entry of Romario and Stoichkov, who notched 46 goals in 1993-94 whilst the Bundesliga entry reminds us of just how good Roy Makaay was. In fact the Dutchman is one of a number of players who feature across multiple leagues, with the likes of Ronaldo, Ronaldo (not a typo), Ibrahimovic, Eto'o, Raul and Berbatov (along with others). Only 8 players have featured in five or more 30 goal partnerships and top spot doesn't go to Messi or Ronaldo, but rather Raul who has been involved in 10 great partnerships. Across two countries, he scored goals with Morientes, Zamorano, van Nistelrooy (2), Ronaldo (2), Guti, Huntelaar, Higuain, and Suker. That's impressive. The other compatibles are Cristiano Ronaldo (7), Messi, Del Piero, Makaay, Eto'o, Berbatov, and Rooney (all five). So there you have it, it's not just the big man-little man partnership (Quinn-Phillips), or the classic goalpoaching number 9 and playmaking number 10 (Romario and Stoichkov) that make great partnerships. It can be wide men with false number 9s, a lone striker with an advanced midfielder (Torres and Gerrard/Drogba and Lampard) or if you're lucky, it may even be Toni Polster and Bruno Labbadia (FC Koln 1994-95). This season will see entries from Suarez and Sturridge, Ronaldo and Benzema, and Messi and Sanchez. 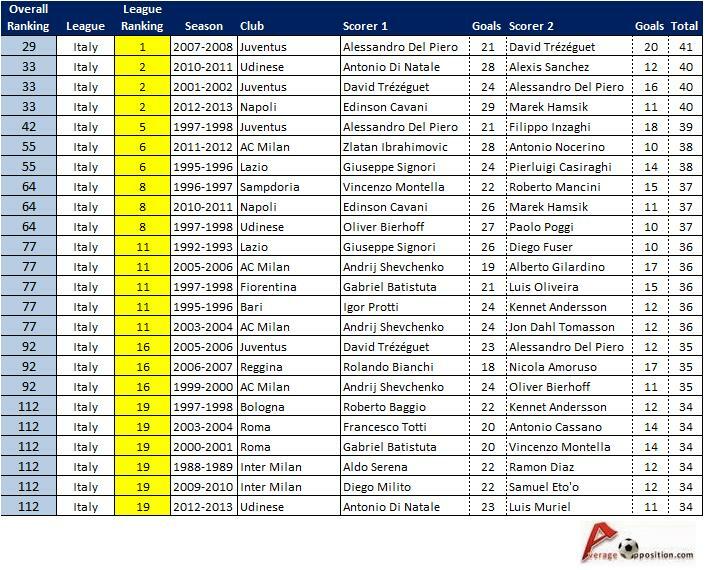 Tevez and Llorente also stand a good chance of joining the elite club along with a few others. I'll chuck the full list up in the coming days. but the real record is in 1926/27 the old English division 2 Middlesbrough duo of George Camsell & William Pease scored 82 in one season! I'll be totally honest, I've never heard of them! Though be interesting to see who Everton's second top scorer was the season that Dixie Dean scored 60! 82 is massive! All league? I guess they're victims of being pre-war stars - there's a bit of a blind spot over that period. I'm afraid I had to call it at 25 years for the above list!